Here is a list of the chapters, the foreign editions currently available, and some comments people have made about the book. Editions coming soon in Japanese, Chinese (traditional characters), Thai and Bulgarian. “More than 15 years ago, I picked up a copy of Getting to Yes by Roger Fisher and William Ury and was immediately excited by their ideas and the thought of applying these concepts in the field. "I had been planning on writing a book on Solution-Oriented Management – you have saved me the trouble." "I have purchased 20 copies of your book and have made it "required" reading for my Quality and Customer Focused Team. It is amazing how viewing the issue from a "positive" solutions focus makes a difference." Bruce Woodings, Halliburton, Texas USA. 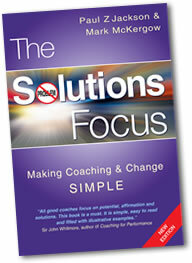 “I've been reading your Solutions Focus book and I've really enjoyed it and found it extremely useful. I think both Paul Jackson and yourself have done an excellent job. I know that my copy will probably become well worn as I read and refer to it many times and show it to other people too! (there's no way I'm lending it to anyone though :-). I'm a Executive coach and team facilitator and have already recommended it to over a dozen people! The Solutions Focus provides a fascinating look at a system that can help people and organizations find answers to the most complex questions. Using numerous enlightening stories and examples from those who have used this type of system to solve some of the most complex problems people and businesses face, the authors have tapped into a plan that can make problem resolution a simpler process for anyone. The organizational process they describe seems to be the guiding principle behind the formatting of the book itself too, because its contents are well-designed and thoughtfully focus on clear language, smart thinking, well-refined ideas, and constant summarization of the key facts that can help readers make use of its carefully conceived strategies. "Before I saw this eminently useful and inspiring book for solution focused work in organisational contexts I´d not have believed that there are sometimes even easier approaches than those already developed by the Milwaukee practitioners. Although "simple" doesn´t mean "easy", Jackson and McKergow manage to provide a usable approach for everybody doing practical work in and with organisations. And they don´t lose the subtlety of the solution-focused approach, but enrich it with a fundus of new didactical and methodological tools. This book is a pleasure to read, full of useful research and results." "I look for a book to in some way help improve my personal performance. The great thing with the Solution Focus is that every time I picked it up it caused me to momentarily stop and think about how I operate and in particular how I could take a more solution focused approach in my work. Great value from a small book." "The Solutions Focus introduces a concept that is both elegant and powerful in its simplicity. For too long, business has wasted time focusing on the blocks to progress rather than finding the routes to success - the Solutions Focus gives you the opportunity to find the routes to success. Don't be fooled, this process is Simple but it is far from simplistic!" Chris Howe – Managing Director of Cchange group and Global change consultant. "Refreshing to see a new way to approaching problem solving which doesn't necessarily rely on understanding what the problem is"